What Does the Oyster Consumer Want? Marketing is not selling. Selling is what you do when you bring your catch to the dealer and ask what the price is. Marketing is telling the buyer why your product is superior to everyone else's and naming your price. It is the difference between being the price-taker and the price-maker. It is hard work and it pays off. Do not try to compete on price alone unless you can be the low-cost supplier, the Wal-Mart of oyster growers. Differentiate your product from the competition by quality, service, packaging, flavor or something other than price. Demand whatever the market will bear. If you have a high price some people might try it just to see what they are missing. Once you get them to try the product, it is your job to hook them with quality or service. Conversely, if you have too low a price the buyer may be wondering what is wrong with the product. If your customers are not complaining about price you are not charging enough. If they are complaining too loudly about price, you probably should be looking for a different customer. Do not compete locally. Local competition only drives down price. I cannot emphasize this enough. If growers have flooded the local markets, then make a little extra effort and get your product out to New York, Boston, Chicago or St. Louis. Having too many people selling directly to the same limited number of local restaurants will result in price wars and nobody will be making any money. This happened on Cape Cod, where a few dozen clam growers saturated the local restaurants and the price fell from 25-30 cents down to 18 cents. Because no one was big enough to get their product to Boston or New York, they all suffered the consequences. If you can't do it alone, form a cooperative to get your product spread around, or work with a good distributor who can do that for you. The market as a whole is big enough for all the high-quality oysters we can grow, and prices are great, but be prepared to get away from locally glutted markets. I once had a young upstart Rhode Island grower steal one of my most lucrative local accounts by offering a much lower price. I could have dropped my price to teach him a lesson, but it would have been a Pyrrhic victory with everyone the loser. I would have preferred if he had won my customer by offering a better product or better service, or by some attribute other than price. This is the key. Set your standards high and work hard at keeping them high. Stuffing a few sub-standard oysters in the box to get a few more cents is shooting yourself in the foot. You jeopardize any long-term and hard-fought market advantage if you let your standards slip. Find a separate market and separate brand identity for your substandard product or throw it back in the water. If you have a quality problem (such as after a spawn): Stop Selling! You will have more customer loyalty if you explain to them that they don't want your product now. If you lose customers because of substandard quality it is very hard to win them back. In the long run, taking a short break from selling shouldn't affect your year-end sales. This goes to what I said about quality, but also includes size. Don’t put different sizes in the same box. Oysters come in a range of sizes, rarely all uniform. Sort them as you pack, and sell different sizes to the customers who prefer them. Variability is not what the chefs want. Some will want small, some large. Find out what the customer wants and fill their need. Customer service is huge. Address complaints aggressively. Oysters often come out of the water dirty and covered with growth, but a little pressure washing does not cost you much. In fact, rinsing off silt is required by ISSC regulations. You wouldn't buy fish wrapped in smelly, dirty paper. Why leave all that gunk on the shell? Pressure washing an oyster costs only fractions of a cent while adding 5-10 cents to the value. Chefs know they won't have to spend as much time scrubbing, and time is money. In addition, the oysters will smell clean and fresh when they open the box. If you can use independent water monitoring as a marketing tool you should. It is easy and cheap to do it yourself if you cannot find a local lab to do it for you. Since the presence of coliform bacteria only weakly correlates with the presence of pathogenic bacteria and viruses, the test is no guarantee of safe oysters, but the testing pays for itself quickly if you use it as a marketing tool. Many locations can have water quality problems after big rainstorms, but that water quality will recover rapidly in growing areas with good tidal flushing. Develop a policy that protects your customers and they will appreciate it! As I mentioned above, don’t try to sell the crappy misshapen oysters with no cup in the same box as your pretty ones. If they have boring-sponge holes eating away the shell or big barnacles on them, or a reverse hinge or no cup, shuck ‘em or chuck ‘em back. Chefs can’t sell these at the raw bar and you shouldn't put them in a position of having to throw away money. There is not much you can do about flavor. Either you have a good taste or you don’t. But if you can, invite some wine snobs to a tasting event to develop some esoteric descriptions. If you have brackish water you might consider a salty wet-storage system to brine them up before sale. Permits are required, but it does not take long and the salt receptors on the tongue are a big part of the sensory equation. Low-salt oysters are a tough sell in New England, but some consumers think oysters shouldn’t be too salty as the salt can mask a sweet flavor. Most restaurants are very conscious of the harvest date on shellfish. It directly affects how long they will be able to keep the product before they have to chuck it or cook it. Hold your product in the water until the last possible minute. If you can harvest early in the morning and get your product on the truck the same day, that is about as good as it gets. You can pack your market size oysters in 100-count bags and leave them in the water so that on delivery day you can pack out quickly and not waste a lot of time counting oysters. I am a big advocate of in-water wet storage. Try to modulate your supply so that you have product year-round. Growers can capitalize on the wild-harvest closures and summer tourist booms by selling to these ready markets at a premium. Chefs expect year-round availability. They hate surprises and don’t like to put your name on the menu if they can’t have your product ALL the time. If you know you can’t ship, at least try to give the chefs advance warning so they can plan ahead. And tell them when you will be back on line! Once you have your name on the menu you have them committed to buying your oyster! If you can’t grow enough product to service your clients year-round, either cut back on the number of clients, raise your prices, or team up with several growers to meet demand. Winning back a customer who may be satisfied with a cheaper replacement is much harder than keeping a happy customer in the first place! Product quality is best in the late fall since the oyster stores up glycogen to make it through the winter, but markets are stronger in spring (when everyone usually runs out) and summer (when tourists flock). Once the wild harvest opens up, many chefs will go for the lower-priced oysters. These are not the chefs I target! I want the chef who considers quality above price. Usually the wild harvest only lasts for a few months. Many growers who have heavy ice issues try to sell out before the ice sets in, so by spring time wholesalers are often begging for oysters. The market seems to soften right when the oysters are at their peak quality, right around Halloween. Trying to sell volumes into this soft market can be frustrating. A 20-percent price cut in the fall will rarely boost sales. If you do drop your price, be prepared to go to battle to get it back up again. If you can be patient until spring you will probably be rewarded. Getting the product to its final destination can be the most challenging part of the whole process. If you are far from a common carrier trucking firm or airport, you may have real problems in shipping. Air freight can double the cost of the oyster and you still have to have someone on the other end pick up and deliver the box. Overnight shipping is exorbitant unless you move huge volumes. Ground rates are reasonable and fast for hauls of a few hundred miles (about $12/box) — except during the holidays. An air-freight box with cold packs, liner and foam runs around $5, so many restaurants will still find it cheaper to buy direct from the farm as opposed to going through a wholesaler. Clean, distinctive packaging is money well spent. Inside-out onion sacks are for suckers who will take what the dealer is paying. That is not marketing, that is selling — very different concepts. A small investment here goes a long way and will yield a high return. Nice custom-printed boxes cost about $2 each, and a custom-printed bag about half that. This is money well spent. The box art is another place to market the attributes of your product that set it apart, while boxes reduce shell damage for fast growing, thin shelled products. Distinctive packaging also helps in those cases where you have someone else illegally selling their product on your trade name. This can become a problem once you develop a brand with name recognition. A little waterproof flyer in the box to remind customerd what they are paying for is a VERY GOOD investment! Keep in mind that selling direct to restaurants is a lot of work and requires substantial upfront investments. First, you have to become a licensed dealer, build a HACCP-certified processing facility with floor drains, stainless tables, bathroom, wash-down sinks, etc. You need your own invoices, bills of lading, truck with covered cooler or reefer unit (for interstate), boxes, bags, tags, computer, software, etc. You have to make weekly (or bi-weekly) calls, lots of door-to-door deliveries, and invoices, while you chase down bad checks and address complaints. Restaurants can go out of business owing you lots of money with no notice. Keep your receivables as short as possible. Nothing hurts worse than having a customer go under when they owe you a few thousand dollars. And it happens all the time. Selling direct to restaurants can make the difference to small firms just starting out because the grower can cut out the middle man and cultivate a few high-end customers at high prices. It also allows you to get instant feedback from the chefs so you can correct any problems before you lose sales. Take advantage of these weekly calls to ask for feedback — show you care. At the same time ask for recommendations for other restaurants that might want to carry your oyster. When you make the move to selling to wholesalers, remember that they will never be as passionate about your product as you are. Many offer a list of oysters with little to differentiate them but price. You still need to get out there and shop your oyster around to the chefs and convince them to ask their dealer for it. Keep in mind that wholesalers object to your selling direct to “their” customers, so it pays to be extra careful if you enter the market at two levels. Dealers usually appreciate it if you help them market to their customers, but if you sell direct to one of their customers you will create a source of friction. You need to have a retail price that is higher than your wholesale price or the wholesalers get really mad. I cannot say it often enough: There is plenty of room for good oysters in this market. There are over 350 raw bars in New York City alone. If we can improve quality then the market will continue to grow. If we don’t, then it is our own fault for killing the goose that laid the golden egg. There are over 300 varieties of specialty oysters available on the market today. Strong competition is good for the industry, and good for the market. Bad product drags us all down. Note: I never mentioned price as one of the things the market is looking for. Obviously there is a limit to this and many customers will base their decisions on price. These are not the best customers. If they don’t care about quality they won’t be selling many oysters. To be a good pitchman you have to be passionate about your product and have enthusiasm in the face of skepticism. You have a great story to tell. Enthusiasm runs high among chefs today for locally produced, fresh food. There is a drive to cut down on “food miles” and use the local farm. There is also a big push, especially in seafood, for sustainable food. Oyster farmers score very high here and we get good marks from Seafood Watch and the groups that put out the little wallet cards that tell you what is politically correct to eat when you go out. Find out about your local Slow-Food Chapter and farmers' markets. Oyster culture is good for the environment: we clean the water, remove nutrients, and provide habitat for little fish, as well as create jobs and stimulate economic development on the working waterfront. Oysters are fresh, nutritious and good for you. They are high in minerals like zinc that is beneficial for men’s health, as well as heart-healthy omega-3 fatty acids. Oysters are low in fat and cholesterol. And a new anti-cancer compound has just been identified that supposedly is being used to fight cancers of the breast and prostate. 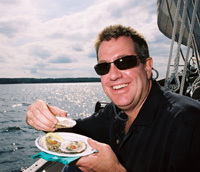 Best of all, oysters have a reputation for being an aphrodisiac, which is one of the best marketing tools ever created. All this is great stuff you can use to push your product during your sales pitch or in your literature. Notice I never said price. Don’t try to compete on price alone. It is a fast route to harder work for less pay. You need a good name that has a nice ring to it. Good names are ones that evoke clean water, exotic locales, anything French, fruit and gemstones. Try holding a contest among your friends. If you cannot pronounce it then you probably won’t remember it. When you get a good one, trademark it and stick with it. It will take at least a few years to catch on. A great product and good marketing can overcome a poor choice of names. With oysters it is easy to get a few more cents for your product. There is a range of quality in the market and a range in price. You can find wholesale oysters for anywhere from 30 cents to over 70 cents (plus shipping). With clams it is a little tougher, since they are recognized as more of a commodity. The range in price is much smaller and many more customers are going to be price-conscious. Many clams are eaten cooked with sauces, so telling a customer you have the best tasting or the safest product is difficult. I have not heard of any successes with attempts to sell branded clams, but that does not mean it cannot be done.